In 2019, there are literally hundreds of companies offering to consolidate private student loans, but before you choose to consolidate your private student loan debt, make sure to take this important fact into account: many of those companies offering to help you with this process are a total scam! This is especially true of many of the smaller, mom and pop type companies you’ve never heard of, who buy your contact information from debt collectors, then send you letters or emails promising to refinance and consolidate your loans at a low interest rate, no matter how poor your credit score might be. What you need to realize is that if the offer sounds too good to be true, then it probably is! BE CAREFUL! I’ve been helping people with private student debt for ten years now, and in all that time, I’ve only found a SINGLE company who actually helps the majority of people who go to them for assistance. Whatever you do, DO NOT RESPOND to the unsolicited emails and letters that you receive from random mom and pop consolidation companies! Consolidation programs are extremely popular because they are typically available without up-front costs, and oftentimes offer significantly smaller monthly payments than existing loans. Keep in mind though that some consolidation programs are better than others, and while some will save you some serious coin, others could end up costing you in the long run. Why Should You Consolidate Your Student Loan Debt? Consolidation Reduces Complexity – Combining all your loans makes managing them much easier. Instead of sending multiple monthly payments to a variety of different lenders, you’ll only need to make one payment to one lender. Consolidation Reduces Monthly Payments – Consolidating your loans almost always reduces your monthly payments. Would you like a couple hundred extra dollars a month to spend on things other than student loans? I know I would! Consolidation Reduces Interest Rates – Consolidated loans almost always come with lower interest rates. If you’ve got a better credit score or higher income than when you first borrowed, this is especially true. Consolidation Saves You Money – Consolidation can literally save you tens of thousands of dollars over the course of your loan. For many borrowers, it’s the best, fastest and easiest way to pay off student loan debt. Now that you know why consolidation is a good idea, let’s get into details about how to pick the right lender. The single most important part of the private student loan consolidation process is to make sure that you choose the right company for assistance! This decision could make the difference between paying hundreds or even thousands of dollars for a “service” that doesn’t provide any actual financial value, and finding one that literally solves all of your financial problems. Remember, this industry is chock-full of con artists and scammers, and you need to make sure that you’re working with a reputable company before you even begin to consider signing any paperwork! 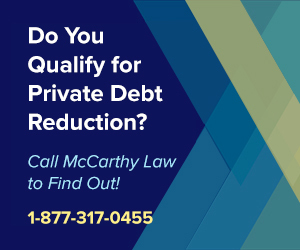 As I already mentioned above, I’ve been interviewing private debt consolidators for TEN YEARS and I’ve finally found one who I completely trust, and refer all of my readers to – McCarthy Law PLC. Why do I like McCarthy? Because they run a nationwide network of attorneys who are backed by a huge organization with the power to renegotiate debt with the private student loan collection agencies and servicing companies that usually don’t give in and offer discounts no matter how badly underwater their borrowers may be. McCarthy can basically take over all the negotiations on your behalf, battle with the lender to get you a debt settlement for pennies on the dollar – usually about 40% of your total debt – and secure a new loan for you that allows you to pay off the old loan instantly, repairing the ding on your credit report, and significantly reducing your monthly loan payments in the process! I don’t send my readers to anyone other than McCarthy Law, and you can get a free consultation with them right now, so give them a call at 1-877-317-0455 to see if they can help you! To be honest, that depends. Not everyone will save money by consolidating their loans. If any of the conditions above apply to your situation, then you could end up saving significant money by consolidation your debt. Who Offers the Best Consolidation Rates? That’s an easy one, and like I mentioned toward the beginning of this post, the biggest lenders typically offer the best rates, because they’re able to aggregate so much capital together that they reduce their risk of borrowing to any individual. One way to figure out which lender will give you the best deal is to talk to all the lenders individually and compare their offers, then go with the one that will save you the most money. However, as I keep mentioning, you have to be so careful to make sure that you’re not getting scammed by a shady consolidator that my suggestion for most people is to simply forget about getting a perfect rate – especially if you have terrible credit – and simply contacting my partners at McCarthy Law PLC. These guys know exactly what they’re doing, they can help almost anyone, no matter how much you owe or how badly your credit has been destroyed, and I trust them completely to take good care of my readers. Don’t risk getting scammed! If you’re going to consolidate your loans, call McCarthy Law today at 1-877-317-0455. Are There Disadvantages to Consolidation? Yes, in certain circumstances there are definitely reasons not to consolidate. Variable Interest Rates Could Backfire – Right now interest rates are near historic lows, making this one of the best times in history to consolidate debt, but if you consolidate with a variable interest rate, then you could end up paying more down the line when the interest rate increases. Consolidating Federal Loans with Private Loans is a Terrible Idea – While it is possible to consolidate your Federal loans with Private loans, that’s almost always a bad idea. First, it disqualifies you for Federal Student Loan Relief, including Forgiveness, all the different Repayment Plans, and even Forbearances and Deferrals. How Do You Consolidate Your Loans? This part’s easy. All you have to do is contact the banks themselves, or one of the aggregators who work with them. They will walk you through the process, letting you know what financial information is required, what kind of package you qualify for, and what you could save by consolidating your debt today. Be prepared for a bit of paperwork though, as the consolidation approvals process does require a credit check, employment check, lots of forms and a bit of work, but rest assured that your significantly lower monthly payments will be worth the trouble! The most difficult part of the process is selecting the right lender, so don’t be afraid to spend some time and/or money on determining the lender that will work best for you. Will my interest rate be fixed, or variable? If variable, what will it start at, and for how long will it remain fixed? Try to lock in a fixed-rate loan if you qualify, as interest rates are lower than they’ve ever been before, and are almost guaranteed to go up in the years ahead. Are there any origination fees for consolidating my loan? If there are, make sure that they aren’t too high, and shop them against the other lenders to see who’s offering the best deal. Up-front costs shouldn’t be thought of as a deal breaker, but they should be considered in your calculations. Will I face pre-payment penalties for paying off the loan early? If the consolidation company has pre-payment penalties, then you may want to look at other lenders. These can dramatically inflate the total cost of your student loans, and should be avoided if possible. Can I get a discount for enrolling in automatic payments? Not all companies offer this, but those that do often provide a slight interest rate decrease for enrolling in auto pay programs, making them more than worth the hassle. Can I get a discount for on-time payments? Not all companies offer this either, but some will provide interest rate drops or even loan forgiveness incentives for making a certain number of payments on time. Can I pay with my credit card without getting charged an additional fee? You probably don’t want to do this anyway, because credit card interest rates are typically higher than student loan interest rates, but it can be handy to have access to this option if you run into financial trouble down the line. Confused about how to proceed? Want additional details not covered on this page? Feel free to ask questions in the comments section below, and I’ll do my best to get you an answer quickly. If this page was helpful for you, then please consider sharing it with friends and family! The more people that find this website, the more time I can spend writing up content that helps you better understand what to do about your student loan debt. Thank you so much for visiting, and thank you for your support. I really do appreciate the help! In the interest of full disclosure, I want to point out that I’ve got affiliate agreements with some of the company’s mentioned on this page. If you get loans funded from any of my affiliate partners, then I will receive a small commission for having referred you to them (about $100). Every single lender on the Internet has an affiliate program like this, but I’ve chosen to work with ONLY the lenders that I feel offer the best rates and service to visitors of my site. I regularly update this page’s content and my preferred lenders to ensure that you’re getting the best deal. Please note that I’m not allowing that to influence my judgement of their services. I’m being 100% honest in my evaluations of each lender. If you have any questions about my agreements with the lenders, or if you have any other questions about the company’s themselves, please feel free to reach out to me with them in the comments section below. My son is really struggling to keep up with the house payment and other debts that he has accumulated. Now on top of that he has to start paying Chase this month. The interest rates are outrageous. Because the loan was on forbearance the principal has skyrocket. His credit is poor as of now. If my son pursues a bankruptcy discharge how will that affect me as the cosigner? I can’t give advice on this as it’s a legal topic and more about finances than student loans, but I think that his bankruptcy wouldn’t affect you. I’m not sure about that though. You should contact a financial advisor, or one of the credit bureaus to find out. Do you have a further recommendation regarding poor credit options. Had my son in March which is making deeply regret my decision to have him, which exaserbates the guilt associated with parenting. I want to consolidate however I make enough that I qualify for no state help. My husband has child support as well. To add all of this together I hardly have enough to live on and stopped paying my credit cards in march. Chase is refusing any payment options. I need help. Any direction would be wonderful. Student loan debt at graduation 69,000 all payments monthly equalling 650 … that is 100 shy of one pay check for me (big weekly) and day care is 600 per month ….. HELP?!?! I would advise speaking to an attorney and pursuing a potential Bankruptcy Discharge. It sounds like you have way more debt than you can possibly afford. Is it all Private, or is it Federal? If it’s Federal, then try calling the Student Loan Relief Helpline. They can give you advise on how best to handle restructuring the debt, getting out of default, etc., and you can reach them at 1-888-906-3065. I have a handful of private student loans through one of the companies mentioned above that offer loan consolidation. When speaking with them regarding my loans, they claim they don’t offer consolidation on private student loans since they’re not bound by the same regulations federal loans use. I’m close to defaulting on the remainder of my loans with them as they claim I owe too much for them to make my payments affordable, yet the amount they want me to pay is well above my means after all of my monthly expenditures are factored in. What would you recommend I look into for relief in making payments? The bad news is that the company servicing your loan is right – they don’t have to offer any sort of consolidation, forgiveness, deferment or forbearance at all. The private student loan industry is much more loosely regulated (basically unregulated) compared to the way that Federal loans are handled. Have you spoken to any of the other companies that offer consolidation though? If you have good credit and enough income, even if you’re barely scraping by on payments, you may be able to get approval for consolidation with one of the other vendors. I wish I could give you some good advice on what to do here, but you will either need to convince your lender to work with you or you’re going to end up defaulting. If that doesn’t work, I would consider threatening whoever services your loan with filing for bankruptcy, telling them that you’re going to pursue a debt discharge (make sure that you would actually pass one of the undue hardship tests before you try this, or they may just call your bluff right away), and seeing if that helps get them moving. Other than that, you’re in a really tough spot. I wish I had better options for you, but there isn’t much you can do other than cutting costs or figuring out a way to make more money so that you can keep up with your payments. Who can I contact to get my private loans forgiven? What’s the best company to work with? Unfortunately, there’s no good answer to your question. First, when it comes to Private Student Loan Forgiveness, there’s nothing that any of these companies can do that you can’t do yourself. All they do is negotiate on your behalf. Instead of paying them a fee to do that, you should contact whoever services your loan and negotiate with them on your own. Be honest about what you’re capable of paying each month, and try to work out a new deal that reduces your total debt, or that extends your loan term to make it more affordable in the short-run. Everyone is facing a different financial situation, so I can’t tell you what will be best for you, but I can say without equivocation that you do not need help paying off your loans, and that going to a third party will likely only cost you more money. Hey Tim. This question is mostly for my private loans. I have them thru AES and Sallie Mae. I am not able to make these payments and am now 2-3 months behind. What do you think my best consolidation option would be. I’m super stressed about this. Personally, I’m not a huge fan of any particular debt consolidation company, because I’ve heard horror stories about all of them. My advice to you – and what I would do if I were in the same situation – would be to contact ALL OF THEM (or at least 3-5 of them), and find out who’s promising to give you the best deal, then go with whoever has the best offer, as long as you feel like you can trust them. This is not an easy process to navigate, because the people you’ll be speaking to are trained to scare you, convince you that they have the best product, and get you signed up as quickly as possible, but as long as you’re cautious, you should be able to find a good fit. Don’t wait though – the longer you wait to get started, the bigger your debt balloons and the harder it becomes to negotiate with any potential consolidator. Get on top of this now and get a resolution in place so that you can start sleeping through the night again.